Rahm Emanuel says the President’s big theme will be “Made in America. The White House is intensifying its attacks on Republicans, after Democratic leaders on Capitol Hill publicly criticized the administration for not doing more to help them retain their majorities. “What I believe, what the president believes—we’re going to win the House and we’re going to win the Senate,” he said. Those comments contrasted with those of White House press secretary Robert Gibbs last week that enough seats were in play this fall that Democrats could lose their House majority. House Speaker Nancy Pelosi (D., Calif.) and other Democrats publicly berated Mr. Gibbs for his remarks, and pressured the White House to take a more active role in trying to re-elect Democrats this November. White House Chief of Staff Rahm Emanuel said in an interview Sunday that the shift has been ongoing for some time and wasn’t prompted by the blowup. The president will focus in the coming days on themes appealing to the economically battered electorate, he said, including policies aimed at keeping jobs in the U.S. In coming weeks, the president will expand his push to create clean-energy jobs to include more traditional industries such as automobiles and railroads. “Made in America” will become the “big theme,” Mr. Emanuel said. On Monday, the president will appear with unemployed workers to press the Senate to pass an extension of expired unemployment benefits. On Wednesday, he is set to hold a rally at the Ronald Reagan building in Washington, where he will sign the newly passed financial regulations bill, again featuring “real people” positively affected by the law, White House aides said. 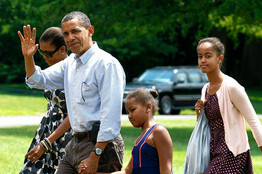 Reuters President Barack Obama and his family return to the White House Sunday after a weekend in Maine. Republican aides said voters have already turned against the president’s health-care and economic-stimulus plans, and the just-passed financial regulatory bill is unlikely to change any opinions. They said Republicans also supported extending expired unemployment benefits but they want to pay for it with budget cut elsewhere. “The increasingly harsh partisan rhetoric from the Obama White House makes clear they are not only very nervous about the upcoming election, but it’s a recognition that they can’t run and win on their own agenda,” said Brian Walsh, spokesman for the National Republican Senatorial Committee. Republicans still hold the whip hand, with the unemployment rate at 9.5%, surging government debt, disheartened Democratic voters and energized conservatives. Appearing on NBC’s “Meet The Press” Sunday, the heads of the Democratic congressional campaign committees, Sen. Robert Menendez of New Jersey and Rep. Chris Van Hollen of Maryland, pressed Republicans to say what policies a GOP majority in Congress would push. The two focused on the Democrats’ record under Mr. Obama. “To all the bad ideas [voters] hear coming out of Washington today, ‘no’ is a good start,” Mr. Cornyn said. Republicans have jumped on what Mr. Boehner called “a full-scale civil war” between the White House and Congress. They depicted Democrats as in disarray, even as Democrats approved the most far-reaching overhaul of financial regulations since the Depression. The White House is moving to repair the breech. “There’s an awful lot of shared anxiety and it feeds on itself,” White House adviser David Axelrod said in an interview. Some House Democrats have speculated privately that Mr. Obama wouldn’t mind if Republicans took over the House, since a GOP Congress could help his re-election prospects. Anxiety is running particularly strong in the House, where the Democratic majority is more endangered and many House members feel mistreated by the Senate. House Democrats have passed a series of bills on energy and joblessness, including extending now-expired unemployment benefits, only to see them stymied in the Senate. “There is a sense that we’ve been doing everything we can to pass the White House’s agenda, but then the White House doesn’t provide the muscle to close the deal in the Senate,” said a House leadership aide. Relations between the White House and Democrats appear to be on the mend. Mr. Biden said Democrats are changing the course of the election by drawing contrasts with their Republican rivals. “I don’t think the losses are going to be bad at all,” he said. 4 Responses to Rahm Emanuel says the President’s big theme will be “Made in America. I am so excited about this …… YEEEEEHAAAWWWWWW!!!!!!! This is what I have been telling every one I talk to!!!! THIS IS THE ANSWER!!! BRAVO TO THE ALLIANCE…… YOU GUYS JUST GAVE ME A SENSE OF HOPE. “Jobs are the top economic priority” Larry Summers recently said (Washington Post, Monday, June 14) speaking in favor of the new economic stimulus package under consideration . Jobs are clearly an important political priority for the Obama administration since the many optimistic pronouncements about the economic recovery underway are undercut by the national unemployment rate which continues to hover around ten percent . Current policies, the administration claims, will deal with this unemployment in time. But, it might just be that there is some confusion about the relationship between the financial crisis and the rising unemployment rate. The “stubborn” unemployment may, in fact, not be mainly attributable to the financial crisis but rather to other forces. By 2008 the US economy was approaching the end of a long boom and was fragile even before the financial crisis erupted. By the late nineties, the US domestic savings rate had fallen to nearly zero and current consumption expenditures had reached new heights financed by rising consumer debt. US imports were very high and, in balance of payment terms, these were financed by an inflow of foreign capital to the US money market. Wynne Godley and other analysts of the Levy Institute from 2004 onward called attention to what they termed these “unsustainable processes”. The “bubble” in the market value of their investment in housing probably played a role in this development by convincing American households that their asset-base was secure thus encouraging the consumption “binge”. No doubt when the threat of a financial melt-down emerged it contributed to a downturn in the real goods-and-services economy and the de facto undeclared tight money policy by banks and the credit institutions since then has provided a further downwards push. But, other important factors were already at work as well. Recent revisions to the unemployment data suggest that the unemployment rate had begun to edge upwards early in 2008 well before the financial crisis exploded. Chief among these over-looked factors in the rise in unemployment has been “globalization” and the rise of “out-sourcing” and “off-shoring” of production of US goods and services to overseas locations. Indeed, the inescapable link between “off-shoring” of US jobs and rising unemployment is the 800 pound Gorilla sitting in the corner which no one wants to talk about. The recent problems of the financial sector have simply served to further dampened down what were already increasingly poor employment prospects. No official data are collected on “off-shoring” but there is considerable evidence that this process is underway. For example, the June 1 Bloomberg business news service reported: “Hewlitt-Packard ..plans to cut about 9,000 jobs and retool its computer-service business.. it will take a $ 1 billion charge for paying severance and modernizing its data centers to provide more automated services to customers, it said to day in a regulatory filing. The Palo Alto-based company plans to replace about 6,000 of the eliminated positions with workers in different countries.” The New York Times (Sunday, June 18, p.14) reported on Whirlpool Refrigerators Inc closing down a factory in Evansville, Indiana, and eliminating 1,100 jobs there as it prepared to open a new plant in Mexico. (Company spokesmen said defensively that 20,000 of its 67,000 global jobs were still in the US.) Other specific examples are easy to find almost daily in the business pages. A well-thought out estimate some years ago by Alan Blinder (Foreign Affairs, 2006) concluded that one million US jobs had already been lost “off-shore” and that the potential loss was many times even the highest estimates of three million then being advanced by some groups. These estimates were made before the financial meltdown of 2007-2008 began to put even greater pressure on US firms to cut costs. A computer search for “information on off-shoring” reveals hundreds of new agents specializing in showing US firms how to go about creating off-shore operation so as to cut their labor costs. The key point is that, however beneficial “globalization,” and the creation of a single global employment market, may be over the long run for all concerned, the inescapable short-run effect is a shift in production ( and jobs ) from one location to another. The “jobs lost” reported in the US unemployment data may be in large part jobs lost to “off-shoring”. But, this point is totally ignored in discussions of how to cope with rising unemployment. The administration’s top economists must be aware of these facts, but they are caught between a rock – what to do about rising this “off-shoring” and its probable contribution to domestic US unemployment- and a hard place – the firm US commitment to free trade and the need not to offend the foreign nations who hold half our national debt and are our best export customers. This kind of job-loss is an on-going process reflecting the powerful underlying force of free trade and comparative advantage. Indeed, Blinder in 2006 saw nearly the entire US services sector as being “at risk”. This risk will not go away and is not powered by the continuing slow-down of the financial sector. Nor would it appear that a new domestic stimulus package would have more than a temporary impact on this sort of unemployment . Thus, the crucial policy issues are: should “off-shoring” by US firms be allowed to continue? And, if so, what measures are needed to help the US labor force adjust to this globalization ? This issue, which is quite apart from financial sector reform, will shape the domestic economic and political agenda in the months and years to come. A frank policy discussion is urgently needed. Why is no one talking about it at all?